The Labouchere is a negative progressive system also known as "Labby", "Crossout", "Cancellation", or "Split Martingale". This system is not as popular as more widely used and talked about betting systems like the Martingale or Parlay betting systems, but as far as its ease and effectiveness of use is concerned, it lies between both of those above-mentioned strategies. 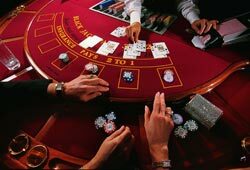 The Labouchere system can be successfully used in Blackjack and is quite easy to use in online blackjack. There are many different variations of the Labouchere betting system but we will consider it in the simplest form. The Labouchere system is based on a sequence of numbers. You begin by writing down a series or set of numbers such as 1, 2, 3, 4, 5, 6, 7. The string of numbers doesn't have to be sequential and can be shorter or longer. For example, the set of numbers 1, 1, 1, 3, 2, 5, 8 will also be fine. The choice of the series of numbers depends on the game you play and the odds you get. Each number in the betting series that you create represents the amount in units or chips that you are going to bet. You add up the first and last numbers in the series and that is the sum you will bet. Add the outside numbers (1+7) and get eight. This is the amount you will bet on your next hand. 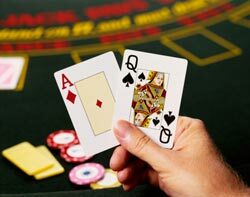 If you are playing $10 blackjack hands, this means you should bet $80. If you win, cross out the 1 and the 7. Move inside to the 2 and the 6. This gives you 8 units again. Bet $80. If you lose, add the number to the end of the series. Now our series looks like this: 2, 3, 4, 6, 8. Our next bet is 10 units, or $100. If you win enough to run out of numbers, the series is complete and you should start over. The drawback of the Labouchere system is that if you keep losing, you have to bet more and more to stay in the series (and win your losses back). This means that you need a large bankroll if you lose. By using the Labouchere betting system, you will always get a profit when you finally finish cycling through your entire betting series by winning all bets. The main principle is that you have to add winnings to the sequence instead of losses. If you win, add one number (the winning unit) to the end of the series. If you lose, cross out two outside numbers. Then put an appropriate target of, say, 10 units profit for even money bets (less for higher odds), and when the series is over begin another sequence. Sequence commencement is 1, 2, 3, 4 so you risk only 10 units per sequence. The system really forces one to bet much when winning and little when losing (which is exactly the opposite of what most people do and what the casino expects).